As 2015 came to close, the city of Houston, Texas, awarded a $900 million progressive design-build project to a joint venture of Water Design-Build Council member firms CDMSmith and CH2M for the design and construction of a 320-mgd water purification project. The project would expand the northeast plant from 80-mgd capacity in order to meet the demands for water by residents and businesses. Immediately signing the contract, the project teams began work in early 2016. Ten years ago, neither a project of this magnitude, nor the expediency with which the contract was signed, would have ever been within the realm of thought for municipal governments. A decade ago, the water design-build industry was fraught with impediments and challenges to using any of the various design-build delivery methods; progressive design-build was only just emerging; and fixed-price or CMAR were considered "alternatives" to the use of design-bid build. At the time, state regulations and local procurement policies championed the use of design-bid build – carry-over baggage from the old construction grant era of the 1970s and 1980s. Policy officials were skeptical that design-build contractors could actually achieve the predicted results of a project being completed on or before the scheduled date – let alone within or below budget. In addition, municipal owners and managers believed they would lose control over their involvement in the design and construction process, particularly during critical decision-making phases for their projects' technology and innovation considerations. And the mere contemplation of an owner embarking upon a risk-sharing arrangement with a design-builder only reinforced the resolve of an "us vs. them" mentality, where design-build contractors were not to be trusted. 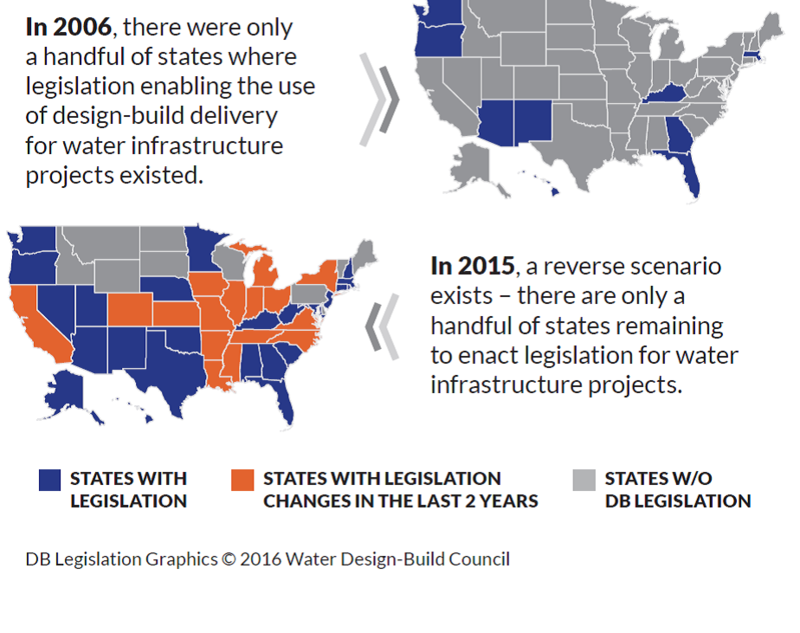 So what dramatic change occurred that reversed the dynamics of an industry to where cities such as Houston, Washington, D.C., Spartanburg and Phoenix (just to name a few) are now embracing the use of design-build delivery as a collaborative process – with many more having successfully completed water and wastewater projects in the past decade? That answer rests with an important action stimulating a process to change an industry with unprecedented results. Looking back again 10 years, a meeting with a group of leading water and wastewater engineering and design company representatives – led by Don Evans, Mark Alpert (CH2M Hill), Joe Adams (MWH), Pete Tunnicliffe (CDMSmith) and others – occurred. These individuals had long since realized that some of type of action was needed in the water industry to provide cost-effective delivery services to municipal owners for their capital improvement projects. However, it was with this meeting, as well as the follow-up activities in February 2006, that the group – now known as the Water Design-Build Council – launched an important mission directed to creating best practices and resolving the myriad of industry challenges through research and education. Research studies focused on listening and understanding the education and procurement needs water utilities and municipalities, spurred the development of education tools and resources to support them. And together with specific examples and case studies, they were able to demonstrate these once "alternative" delivery methods were indeed successful. What has changed/evolved in how utilities view the use of design-build delivery? The decade of progress with industry changes, documented by WDBC, speak for themselves – and most noteworthy are these statistics. 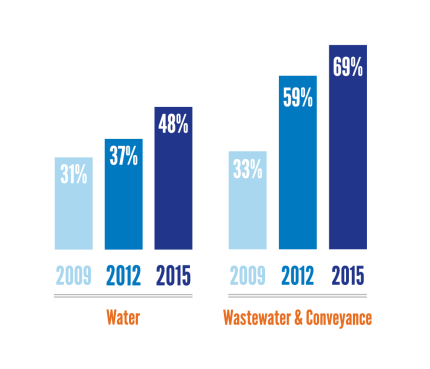 Since 2005, the use of design-build delivery for water and wastewater projects has gone from 14 percent (in 2006) to reaching towards 70 percent in 2016. A major change occurred in the legislative process throughout the states as shown below. In addition, the sharing of risk between owners and design-builders, once a forbidden topic, has evolved into a more balanced approach, as there is now a greater understanding among parties that collaboration yields success. The focus on a collaborative approach between owners and design-builders, such as progressive design-build delivery, is now viewed as a valued benefit and gaining increased use, as demonstrated in the recent Houston, Texas, procurement. Of all the delivery models, however, progressive design-build is the fastest growing, with the industry accepting and using model procurement guide materials produced by WDBC. "For over the past decade, we’ve been calling this 'new way' of doing things alternative delivery. Except, we all recognize that design-build isn’t the 'alternative' any longer. In fact, design-build, construction management-at-risk and even design-build-operate, and public private partnerships are all now commonly accepted means to getting projects done right. In reality, the traditional design-bid-build approach has now become the alternative – the exception – in the project delivery toolbox." What do utilities need to know, prepare for and apply in the future? This question is answered most clearly with the responses from WDBC’s 2015 research study on the Lessons Learned of Executives and Managers in Using Design-Build Delivery. The strongest and most uniform response to this question is a core emphasis on education and sharing of experiences. "The majority of managers and executives agree that impediments to using design-build delivery occur when decision-makers and staff have limited knowledge and the experience required to achieve a successful project. They cite as an essential action, making a commitment early-on to an education and training program in order to effectively prepare for, procure and manage a successful project from inception to transition. In addition peer-to-peer education is also viewed as a beneficial support to the education process as well as sharing the lessons." Moving forward into 2016, the water design-build industry is gearing up for an increased demand in education and training, to support municipalities in using these delivery models. Early this spring, the new WDBC Municipal Handbook for Design-Build for Water and Wastewater Projects will be available. To learn more about some of the 2015 significant water design-build projects please visit the Water Design-Build Council website.